Biodiversity studies are overwhelmingly concerned with terrestrial systems and although there are notable exceptions (e.g., Brooks, 1950), aquatic diversity of fresh waters is less well researched. Lakes present a special case for diversity studies: they vary greatly in age and type but exist as discrete discontinuously distributed units that occur in most regions of the earth. Those lakes that are geologically old tend to support significant endemic biotas, examples being Lake Ohrid (former Yugoslavia) and the African Rift Valley lakes. However, of all the world's lakes, Baikal is perhaps the most remarkable for biodiversity. It is unique in supporting a major deep-water (> 1200 m) fauna composed almost entirely of endemic species. So intense have been the speciation processes in Lake Baikal that large species 'flocks' have arisen in some groups. Whereas molluscs have radiated strongly in Lake Tanganyika, crustaceans have formed the largest species flocks in Baikal. Particularly intense speciation has occurred in the Gammarididae. A full account of diversity and endemicity can be found in Kozhov (1963), Timoshkin (1995), and Kozhova and Izmesteva (1998) but some indication of the degree of endemism in selected groups is given in Table 17.3. Precise diversity data are sometimes lacking for Baikalian species because new species and revised classifications are occurring continuously. Nevertheless, most groups show a high degree of species-richness and endemicity and a brief systematic review follows. The nerpa seal (Phoca sibirica) is Baikal's only endemic mammal. It is, however, thought to be a fairly recent arrival to the lake, dating to the Pleistocene period (Kozhov, 1963; Fryer, 1991). Vertebrate diversity is greatest for fish and approximately 56 species occur in the lake. Six species have been introduced and some shallow-water species are cosmopolitan (e.g., the perch, Perca fluviatilis, and the roach, Rutilus rutilus) but the majority are endemic. Cottoid fish ('sculpins') are all small (usually < 20 cm long) and are particularly diverse, consisting of 29 species, the majority of which are adapted to benthic life. Some species are adapted to shallower waters (e.g., Cottocomephorus and Procotus spp.) whilst others occupy deep water (e.g., Abyssocottus spp.). Interestingly, the visual pigments present in deep-water cottoids suggest a marine ancestry (Bowmaker et al., 1994). Two exceptional cottoids, Comephorous dybowskii and C. baicalensis (glomyankas), live in open water, optimally around 100-300 m depth, and are adapted to the pelagial by possessing large pectoral fins and scale-less, translucent bodies with reduced ossification. These and other cottoid fish and their fry are a key group in the food web structure of Baikal, being the major food source for seals and other fish. The most important fishery in Baikal is that of the omul (Coregonus autumalis migratorius) and, to a much lesser extent, of the Siberian grayling (Thymallus acticus vars.). These open-water fish only differ from taxa elsewhere at the subspecies level and C. autumnalis has a circum-global occurrence in northern boreal waters (McPhail, 1966). Within this group the impressive diversity of the gam-marids has been already noted but the variety of form exhibited by this large group is also remarkable (Figure 17.6). Fig. 17.6 Some examples of Baikalian amphipods. (a) Hyalellopsis carpenteri Dyb. (30 mm), (b) Acanthogammarus maximus Garjajew (70 mm), (c) Macrohectopus branickii Dyb. (35 mm), (d) Hyalellopsis costata Sow. (10 mm). Morphological studies have been carried out over at least the past 120 years and the endemic taxa are now accommodated into three endemic families (see Kamltynov, 1992 in Kozhova and Izmesteva, 1998). Morphological diversity is linked inextricably with ecology and the species exploit a wide variety of habitats. The filiform Macrohectopus branickii is adapted to the open-water pelagial zone below 150 m depth. Of the deep-water species, some taxa exploit a fossorial existence within deep-water sediments (e.g., Hyakllopsis spp.). Other taxa are predatory forms that actively patrol at, or just above, the sediment surface. In shallower waters, armoured gammarids are common, the largest of these is the carnivorous Acanthogammarus maximus (up to 70 mm in length). Certain species occupy very specialized niches and Spinocanthus spp. is an elegant grazer on surfaces of Baikal sponges. The upper littoral zone abounds with smaller gammarids (some endemic, some not) and it is the less specialized species, such as Gmdinoides fasdatus, that have colonized several rivers and lakes around Baikal. These upper littoral forms can be very abundant with up to 30 000 individuals per m2 (Kozhov, 1963). Tight zonation means that some species are restricted to a depth of several metres but, because of the lake's great size, this zone is over 1000 km in length and so offers considerable scope for the isolation mechanism to operate. 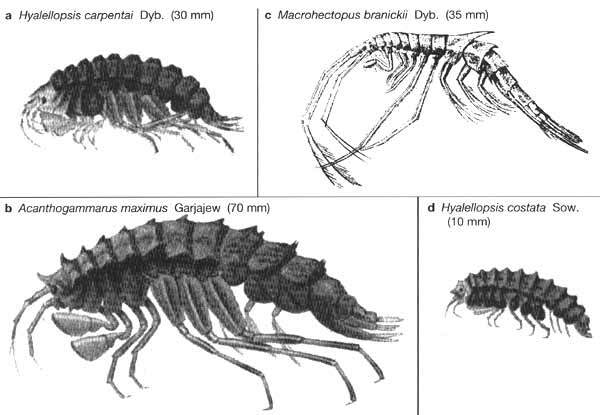 Other Crustacea of particular interest in Lake Baikal are the Ostracoda and Copepoda. The ostracods are very diverse with over 90 per cent of species being endemic and they are ubiquitously distributed throughout the lake, while planktonic copepods are less diverse but occur in high numbers (Mazepova, 1994). The endemic Epischura baicalenisis is often the dominant zooplanktoner and is a key species in the Baikal food chain. Benthic cope-pods (Harpacticoidea and Cyclopoidea) are also largely endemic but are diverse with new species recently described (Boxshall et al., 1993). Those that spend their larval life within Baikal are represented mainly by the Pkcoptera, Trichopetera and the Chironomidae group. Plecoptera and Trichopetera do not live below 20 m, whereas the Chironomidae are distributed not only in the littoral but also at the greatest depths. Representatives of the Sergentia genus have formed a diverse subgroup of endemic chirinomid species (Proviz et al., 1994). The endemic Trichoptera are famous for their mass abundance on emergence after the ice breaks, usually in June. Freshly emerged species of Baicalina, and to a lesser extent of Apatania, can form 10 cm thick living caddis fly carpets and these slow-moving black and grey insects ascend any structures (such as trees) rising near the lake shore. Of the other benthic macrofauna in Lake Baikal, the Mollusca, Annelida, free-living Platyhelminthes, and the Porifera also offer impressive examples of within-lake diversification. More than 180 species of mollusc occur of which 125 are endemic (see Sitnikova, 1994) and these are predominantly Gastropods. Although the Baikalian gastropoda do not show nearly as much diversity as found in the African great lakes, there are about 15 species occurring in deep water (> 200 m depth), mainly in the genus Benedictia, and possess poorly calcified shells. Littoral gastropods are much more numerous and endemic taxa within the families Acroloxidae and Planorbidae are often dominant. The Annelida is also well represented in Baikal with over 200 species of which about 75 per cent are endemic. One of the most interesting and unusual is the endemic tube-dwelling polychaete Manayunkia baicalensis. Polychaetes are rare in fresh waters and invariably attest to some past connection with marine systems. Oligochaetes are far more diverse and achieve high densities (up to 20 000 m2; Kozhova and Izmesteva, 1998) on silty bottoms where food supply is good. They extend to the deepest depths of the lake, but in the food-stressed abyssal zones populations are very sparse. Free-living Platyhelminthes (flat worms) or turbel-larians were rather less researched, but burgeoning taxonomic work in the late 1980s and 1990s has added some 20 new species per year to this latter group (Timoshkin, 1994). The number of species is now about 80 and they are separated mainly on reproductive structures and, more unusually, on colour, with red, yellow, brown, black, or variegated taxa occurring in shallower waters. Several species flocks are described (in the Letithoepithdiata, Tridadida, and Proktithophora; see Timoshkin, 1994) and perhaps the most interesting are the wholly endemic deep-water species that are relatively extremely large, Baikaloplana valida being up to 30 cm in length. The well-known sponges of Lake Baikal are in the main limited by zoochlorellae to the littoral region. Best known are the endemic Lubomirskia baicalensis which can form vivid green branches rising up 70 cm from rocky substrata and species of Baicalospongia which form large crusts over stones. Other major groups include the Nematoda, Protozoa, and Rotifera and these are all species-rich (Kozhova and Izmesteva, 1998). Much work on the classification and taxonomy of these groups remains to be done and opinions differ on the reported degrees of endemism. Several theories have been suggested for origin of Baikal's flora and fauna (Kozhov, 1963), and some of the contemporary endemic species are probably derived from saltwater ancestors. With the exception of the partially closed shallow bays (locally termed sors) on some eastern shores of Lake Baikal, higher plants are essentially absent from the open littoral region. Exceptions are Elodea canadensis which was introduced into the lake in the 1950s and, with cosmopolitan Myriophyllum and Potamogeton spp., it can be locally common in sheltered regions. Most of the littoral region of the main lake is divided into zones by various species of benthic algae and this zonation is most clearly marked on rocky shores. Ultothrix, Tetmspora, and Draparnaldioides species are mainly responsible for the zonation pattern over the upper c. 20 m of the littoral. Benthic macroalgae do, however, extend to greater depths with Cladophora and Draparnaldioides taxa together with green cushions of the alga Aegagrophila extending to more than 30 m (depending on water clarity and location). With the exception of Ulothrix, all these genera have endemic species in Baikal and in 1976, Skabichevisky used branching structure to transfer Baikalian Drapamaldia taxa into a new endemic genus (Draparnaldioides) consisting of 15 species. Perhaps the most important and interesting group of algae in Lake Baikal is the Badllariophyta or diatoms. Diatoms are ubiquitous siliceous microalgae that are very diverse and many species are extremely good indicators of water quality. Furthermore, because they are siliceous, their remains (frustules) are often well preserved in sediments and so can provide an historical record, not only of past changes in environmental conditions (see pp. below) but also of past species diversity. Many diatom taxa are cosmopolitan but Lake Baikal supports a remarkable number of endemic species. Early pioneering studies, especially by Skvortzow (e.g., Skvortzow and Meyer, 1928) described many new endemic benthic and planktonic species. The most common planktonic diatoms in Lake Baikal are endemic and the annual diatom crops are usually dominated by Aulacosdra baicalensis and Cyclotella minuta. About 30 modern species of diatom plankton are known and a list of over 400 benthic taxa was published in 1993 (Pomazkina and Votyakova, 1993). According to Skvortzow, almost 50 per cent of diatom taxa in Baikal are endemic. However, taxonomic revisions and descriptions of new species and more ultrastructure studies are constantly changing species estimates for Baikal (Flower, 1993). Even more recently, molecular studies are being used to measure genetic 'distances' between taxa (e.g., it is shown that A. baicalensis is very closely related to another endemic species, A. skvortzowii (Shcherbakova et al, 1998). These two taxa probably diverged during the existence of Lake Baikal. Benthic diatoms have received relatively little attention from taxonomists in recent decades but modern studies, again using ultrastructure and molecular techniques, will doubtless expand the number of recorded species. It is already clear that the proportion of endemic taxa increases towards the deep littoral (20 m and below) and that centres of hyperendemicity exist around the lake. Although not as extreme as that found in some animal groups, some benthic diatom genera, such as Didymosphenia, provide evidence of recent speciation. One of the first questions to address with regard to the origins of the Baikalian biota is whether Lake Baikal should be considered a crucible for evolution and speciation, or a natural museum of relic taxa. There is, however, no simple answer and no 'model' group to study, since the present biota is the result of past processes that undoubtedly involved different evolutionary patterns and mechanisms, balanced with serial immigrations and extinctions that have all operated differently within each organismal group. Ideas on the origin of Baikal's fauna, developed in the earlier part of the 20th century, mainly stem from Berg, Dorogostaisky, and particularly Vereshchagin (see Kozhov, 1963; Kozhova and Izmesteva, 1998) and essentially suggest the biota is derived from at least several sources: marine immigrants, ancestral endemics, or local species and immigrants widespread in Asia. As recent accounts indicate, convergent and parallel evolution and the lack of fossil records of many groups complicate interpretation of some morphological studies (e.g., Martens, 1997). Refined and redefined comparative morphological studies are now being combined with new molecular techniques to tackle diversity problems and trace taxonomic links within and beyond Lake Baikal's modern biota (e.g., Timoshkin, 1997; Sherbakov, 1999). Translating genetic sequences into distance measures and evolutionary time scales requires assumptions about rates of change that are not universally accepted. Nevertheless, convincing recent work indicates that several major speciation events occurred several million years ago in Baikal (Timoshkin, 1997; Sherbakov, 1999). Perhaps more interesting is that molecular studies also indicate that some of the most highly morphologically adapted species in Baikal are more closely related to non-Baikalian taxa than to other endemic species (Sherbakov, 1999). Isolation mechanisms produce new species and basically these operate within (sympatry) or across (allopatry) reproductive barriers. Lake Baikal offers a continuous and well-mixed aqueous milieu, but recent geological changes, such as the emergence of the Ushkany Islands and separation of the Maloe More, are likely promoters of local speciation events. The uniform deep-water biotope in Baikal occupies some 10 000 km2 and here vicariance speciation is perhaps more difficult to explain. Species flocks are a special feature of ancient lakes and probably the world's best aquatic examples are ciclid flsh in Tanganyika (e.g., Greenwood, 1994) and the gammarids of Baikal. Flock-forming processes are under constant debate and formulating a coherent unifying explanation offers a robust challenge to students of evolution and ecology. Centres of high endemism might merely reflect low extinction rates (Rosenzweig, 1995) but this begs the question about causes. Ecology and competition are the drivers of evolution but a gap needs bridging between these modern processes and the slow process of speciation. Comparative molecular genetics and morphological studies in Baikal are however beginning to elucidate evolutionary patterns such as the Pleistocene radiations of cottoid fish (e.g., Timoshkin, 1997). Rigorous hypothesis testing about the past and present distributions of endemic taxa in Baikal is required, and in the case of diatoms, this lake is fortunate in having at least 5 million years of excellent fossil records. Despite the interest in evolutionary mechanisms, researching the nature of endemicity and its relation to local and regional distributions in the lake is equally important. Evolution certainly generated the endemic biota of Lake Baikal but ecology in its broadest sense determines the proportions of taxa present today. How species distribution patterns and centres and gradients are regulated and related to endemicity and to current ecological conditions in the lake remains poorly known. Species rarity is an important consideration in conservation ethics (Galston, 1994) and its relationship within endemicity with Baikal requires elucidation. Furthermore, in order to place Baikal's biota in an objective global context, endemic taxa should be compared with more cosmopolitan forms using cladistic analysis as well as ecological and biogeographical criteria. Especially for the lower groups, (e.g., protozoa, benthic algae, flat worms), verified species inventories in relation to systematic mapping of habitat type and location is required to quantify diversity patterns and to identify vulnerable key taxon groups and habitat zones. Such work is a prerequisite for the formulation of effective biodiversity monitoring and conservation policy for this lake's largely unique benthic biota.